I bought a cheap soldering iron. After reading articles and watching videos, I learnt that cheap irons get their resistor burnt easily. And many a times the iron becomes black as soon as you start heating it and then it cannot be tinned. Should I tin my iron first as written everywhere or file it? I have also got soldering paste and one meter silver coated solder. Should I first apply the soldering paste on the iron then heat it for tinning? Here is the iron. It does not look like pure copper but the cover says its pure copper. So now that I have shared the final discription of my problem. Please tell me if your opinions about filing it have changed. Thanks to all of you for helping. Never file a soldering tip. Filing it will remove the protective layer, allowing the metal underneath to be eaten away by solder resulting in permanent damage over time. Tin it immediately once it first starts heating up, and every few times you use it as required. 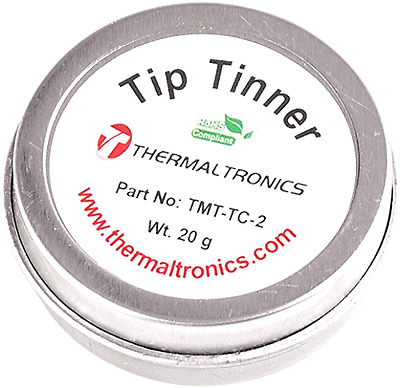 The best way to keep a soldering iron tip in good shape is by using "tip tinner" - available at the usual places. It is well worth the modest investment, regardless of the cost of the iron itself. Bottom line is that you want it to actually work. That stuff is great. Whenever I turn on my iron and it heats up I push the tip it into this powder, (where it melts to it), wipe it on a damp sponge, then apply a bit of solder. Then when I am finished working, I wipe it off again, shut off the power and push it into this powder again so it cools all nice and clean. As said by Ignacio ....for most modern hobby tips (certainly for PCB/electronic work) you would never file them. The surface is plated to prevent the copper heat conductor from dissolving in the solder. Read this for help on the modern plated tip. That said, there are still plain copper tips produced (typically very large as used in stained glass hobby work) that do need filed. The copper dissolves in the solder as it's used so you end up with work pits in it. Never file a soldering iron tip. I did an accidental experiment with this a while back; I'd damaged a (Antex CS) tip when it rested against some wood for a while while switched on. Since I had an "emergency" need for it I filed it just to get it "working" again for a few non-critical joints. It did the job to hand, but afterwards was eaten away in a very short time as the solder got to it. Under normal circumstances there is never a reason to file down a tip. It ruins them. IF the tip of the soldering iron is either a non-longlife, non-plated type ... or no longer plated due to wear... then filing is indeed necessary. What works best is filing it when heated - this obviously is best not done with an expensive file, it will damage the file eventually - and directly applying solder before a new oxide layer has time to build. Sometimes, scraping with a thin (disposable/segblade! You will damage a proper edged tool more than you think heating it like that...) knife or screwdriver (thin!, otherwise you conduct too much heat away) immersed in a solder drop gives the most even tinning, since there is no air contact of the bare copper before it wets with tin (this method even works good enough for aluminium to connect a wire to it if you are really patient :) ). As others have said, this is not the right treatment if the tip is of the plated/longlife type and still intact - once you do it, you will need to frequently do it. Once you are treating a soldering iron tip as essentially a tinned copper wire, you might want to try hammering the rough tip shape (on hot or cold tip) before reaching for a file: Copper work hardens when hammered, so you get a harder and more durable tip. Explanation about the "do not use expensive tools": While it is unlikely that a file or knife will wet with electronics grade solder and flux, even less if it is made of stainless steel - chromium alloys are a dog to solder to!, files and knives are heat treated at production time, adjusting hardness, toughness, corrosion resistance. If you heat any of the tool to >>150°C, the heated region of metal will have the metallurgical structure achieved with the heat treatment permanently altered. Back in the Paleolithic times soldering iron tips were made of copper. You had to file the oxide and pits out of them before you could tin them. In fact, if you go back far enough, soldering irons were big copper hunks that had to be heated with a blowtorch; none of that newfangled electric stuff. That was then; this is now. Soldering iron tips now have a special coating. If you file that coating off, you will never get solder to wet your tip. So DON'T FILE. Let it get hot, and wipe it on a wet sponge. If there are pits or other defects after wiping, discard the tip and get a new one. One thing that hasn't been mentioned is that as a novice using a cheap iron you're likely to get burnt stuff on there from stray bits of insulation, flux residue, etc., which might be termed crud. Sometimes you want to remove this crud and a damp sponge won't do it. That's when a brass brush comes in handy. There are brass wire sponges sold for the purpose, but I find a brass brush a cheap and effective solution. Some "brass" brushes are actually plated steel and will damage your tip; I've always found suede brushes (from shoe shops) to be real brass. I was horrified at the thought of filing a soldering iron. I spent $80 for mine used. Most modern ones are steel and carefully plated so they can last years. Tin them with plenty of rosin core solder if they need it, flick off the excess somewhere it won't hurt anything (not a carpet). Keep a damp sponge or wet rag around. When the iron is hot, wipe off the oxidation onto the sponge and immediately retin. But you don't need to do it a lot, you'll get a feel for it. Oxidation blocks the conduction of heat. You want that tip clean so you can heat a joint in the minimum possible amount of time. Ruin a few parts (taking something apart is good practice) and you'll learn. If you practice plucking used parts out of a junk board of through-hole mounted parts with your fingers you'll see the importance of a clean iron. When the iron isn't clean enough it takes longer to melt the solder so the whole part gets heated up. Then I remembered I used to have one that was copper or brass and it would get pits in it. Mostly that's from letting it get too hot, or letting it sit hot for hours because you're planning on using it. File those a tiny bit when you can't find a clean spot to melt solder, but tin it immediately. You can file just one side and use that. I have filed a soldering iron tip in the past, but it was a last ditch effort to get more use out of it. The tip has blown chunks out the top and had lost its point - it was like trying to solder with a hot sausage than a tool. Answer: Generally filing is bad, but sometimes rules are to be broken. Not the answer you're looking for? Browse other questions tagged soldering solder-paste or ask your own question. How to solder something as tiny as this?